The Art Feast event in the Cherry Creek North shopping district has every business do something special to help make the afternoon a fun one, and author Aaron LaPedis’ gallery Fascination St. Fine Art is no different. 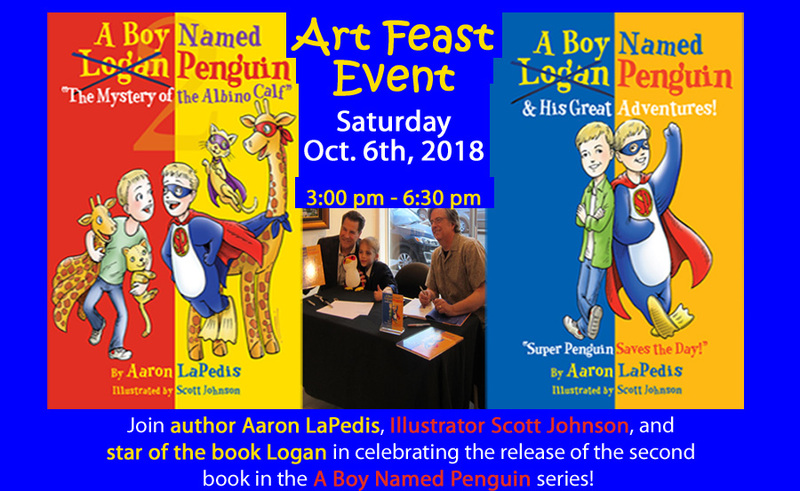 We will be hosting a book signing celebrating the release of the next amazing piece in the A Boy Named Penguin series, The Mystery of the Albino Calf! There will be a special edition of the book available soon, a VIP edition! This VIP edition will come at a higher price, but for great reasons – there’s a limited amount of these VIP books, and they will be signed and numbered through 250 books. Also, $5 of every sale on this edition goes directly to the Autism Society! What a great way to help raise money for a worthy cause. Available at the signing will be the first book, stickers, and pins for all the Super Penguin fans out there. Hope to see you there! Be sure to check out our Facebook event to get all the details! The first installment in a beautifully illustrated children's book series, dedicated to raising awareness and acceptance of those living with autism.